Excellent gps tracking system and very accurate. I have been looking for an app that would allow me to share my location live with my wife so she can see exactly where I am on a long trip and this does the job beautifully. Peter G.
Great for running events. Using this app when I am competing in long distance running, allows my friends to see my progress and where I am... Much better than following me on the official competition sites where you normally only get 3-4 split-times. Daniel N.
Very useful app. Have been looking for a way friends could track my progress in training and events. This works!! Jason G.
LocaToWeb is first of all a position tracker that updates to web in real time. When a track has been setup and started it will post the current position, heading, speed, height and trail to LocaToWeb.com. Then friends and family can follow the movements on LocaToWeb.com. For the record: Tracking only occurs when the Start button has been pressed, and lasts until the Stop button is pressed. Just install the app, setup a track and hit Start, no need to register. However, registering is encouraged since it allows app owners to administrate and maintain their tracks on LocaToWeb.com. It also makes it possible to switch mobile phone and still be connected to the same account and track history. LocaToWeb is available for Iphone (IOS), Android and Windows Phone. Completly ad free. The app supports English, French, German, Italian, Norwegian, Portuguese, Russian and Spanish. Each track is given a descriptive title when setup. This will identify the track in recent tracks on LocaToWeb.com and in the recent track list inside the app. Registered users will also find the track in the list of tracks inside their account on LocaToWeb.com. The track owner is identified with an Alias that is specified on track setup. This enables the users of the app to stay anonymous when their track is featured on LocaToWeb.com. Registered users can choose to track in private mode. Then the track will not be publicly visible on LocaToWeb.com, but only accessible from the list of tracks inside the Account or from the email users receive on track setup. With a simple touch you can alert friends via sms, email, messenger or publish the track to social media while tracking. You can also setup e-mail alerts that are sent automatically to selected addresses. 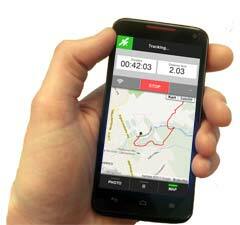 App owners can setup a Race and let other app users join in on the same track. Up to 12 participants can then be tracked in the same map view on LocaToWeb.com. Users that join the race must enter a “race code” that is generated on the initial race setup. When a track has been started it can of course be stopped. However, it can at any time be resumed. This makes it possible to pause and continue the track when ready. It can even be continued the next day. While tracking the app displays the GPS accuracy and also indicates if the phone has a data connection or not. Tracks can be setup and started without a connection. This is useful when tracking in areas with poor reception, for instance in the mountains. The track will synchronize with the web site when connection is back. The capture feature makes it possible to take photos while tracking. These will instantly be uploaded and displayed on the map exactly where they were taken. Follow other trackers inside the app and add your friends as favorites by tapping on the star next to one of their tracks. Use the app for both tracking and watching! Choose between Metric (km and m) or Imperial (miles and feet). The app has a toggle switch that enables the screen to stay on. This is great when you want to monitor the app data when the phone is docked in the car on a bicycle. This feature can be turned on and off at any time during a track. In your account you can create a new group or join an existing group with an invitation code. Get a custom page for your friends, club or work. Publish tracks on your web site or blog by using a simple copy/paste action. Inside your account on locatoweb.com it is possible to export and download the track in GPX format for storage and re-use. Look for the download icon in the track listing page. Inside your account (edit track) you can upload a GPX or KML file that will be pre-loaded on the map. This service is expensive to maintain and we reserve the rights to block excessive usage and abuse if necessary. LocaToWeb can be used for business purposes, but then a Business Account is required!